Yom Kippur is the most serious day of the year for the Jewish people. With a focus on repentance and atonement, on Wednesday evening Jewish people all over the world will begin fasting and spending time in their synagogues. This week on the program Chris explains Yom Kippur and how for the Israelites, it was an act of God’s divine grace. When we think about how a Holy God wanted and still wants to be dwelling with His people, we should be in complete awe. God dwelled in the Tabernacle even though it was surrounded by impure people. And every year there had to be a time of purification, which is why God made the Day of Atonement or Yom Kippur. In our first segment Chris talks about the idea of a scapegoat during Yom Kippur. The high priest chose two goats, one was for sacrifice and the other to send away. The scapegoat took the sins and impurities of Israel that were built up over the year and go off into the wilderness. We’ll hear about another scapegoat that the Prophet Isaiah talked about in Isaiah 53. There Jesus is seen as our scapegoat. Chris Katulka: For our Canadian listeners, I want to invite you to our Prophecy Conference in Winnipeg, Canada, September 27th through the 29th. We're going to be studying the Olivet Discourse, the prophecies of Jesus. Again, that's September 27th through the 29th. It's a free conference. Visit FOIradio.org to find out more information. Steve Conover: We, as Christians, worship Jesus because of the sacrifice He made for us. When He became our scapegoat, he took on God's wrath and defeated death, the very death that we deserved. This idea of a sacrificial scapegoat was not new to the Jewish world of Jesus. It goes back to the Old Testament when Jewish people honored Yom Kippur, or the Day of Atonement. Steve Conover: Welcome to The Friends of Israel Today. I'm Steve Conover, and with me is our host and teacher, Chris Katulka. Chris Katulka: Yeah, the Jewish Fall holidays of Rosh Hashanah, Yom Kippur, and the Feast of Tabernacles are upon us. And this week, the Jewish people will honor Yom Kippur, the Day of Atonement, when God provided very specific way to find temporary cleansing for sin for the Israelites. Today, we're going to look at one particular aspect of Yom Kippur. It's the scapegoat. The scapegoat that God provided who all the sins of Israel were placed up and then sent away into the wilderness. And then, later on the program, I'm going to share with you the story from Leviticus that became the impetus for God establishing the Day of Atonement. Steve Conover: We look forward to today's study, Chris. In the news, a poll conducted by The Jewish Chronicle in the United Kingdom found that nearly 40% of British Jewish people would seriously consider emigrating if Labor Party leader Jeremy Corbyn became Prime Minister. Jeremy Corbyn has dined with Hamas, honored Palestinian terrorists, and recently argued that considering a racist state is not the same as anti-Semitism. Chris Katulka: It's an atrocity that Jeremy Corbyn would have even made it this far to become Prime Minister of the United Kingdom. Here's my take, Corbyn is not the only politician that really has an anti-Israel agenda or has even said anti-Semitic things. There's a rise even in American politics among the progressive left who harbor anti-Israel sentiments like Corbyn. Let's pray that Western countries like the United States and the United Kingdom hold fast to supporting the State of Israel, the only Western democracy in the Middle East. Chris Katulka: Okay, this might sound kind of nasty to talk about right now, but I think it's really the best illustration I can think of. Did you ever turn on your faucet in your bathroom, maybe your bathroom sink or even your tub or shower, and you noticed the water doesn't drain as fast as it used to? You know what's going on, but you just let it go. And then, over time, you begin to notice that the water drains slower and slower and slower until you realize the drain is now completely clogged. So you have to get brave to save a few dollars, and you start digging around, and you start pulling out bits and pieces of grime and dirt. The deeper you go, the worse it gets until all of a sudden that annoying drain, once that thing is pulled out, seems to function just fine again. Now, you might thinking, "Chris, what does this have to do with the Bible?" Well, friends, the Jewish holiday of Yom Kippur, the Day of Atonement, it's upon us, and I was reading through a Jewish commentary on Yom Kippur. Chris Katulka: This is what I read, and I want you to hear this. "The distinctive rights prescribed here involve rare practices called the Right of Riddance ..." This comes from a Jewish commentary. "... which affect the removal," listen, "the removal and destruction of impurity. The transgressions of the Israelites and their priests, which produce impurity, are dramatically transferred to the scapegoat, which is driven into the wilderness never to return. Certain parts of sin offerings are burnt to ashes outside the encampment rather than on the altar, and Leviticus chapter 16 also ordains the use of sacrificial blood in unusual ways during the purification of the sanctuary. These two processes, the purification through sacrificial blood and purification by riddance, are woven into one of the most complex rituals to have reached us from any ancient society." Chris Katulka: That comes from a Jewish commentary. And as I was reading through that commentary, which we'll unpack a little more in a moment, that writer, that theologian, said that Yom Kippur, the Day of Atonement from Leviticus 16 is all about dramatically removing impurity. Impurity that is created by the Israelites and impurity that's produced by the priest, too. Not just the Israelites, but the priests, as well. Chris Katulka: When I was thinking about impurity, the first thing that came to my mind was when my pipes get clogged with impurities, the nasty, the gunky, the hair, the dirty stuff that comes from who? That's right. It comes from us. The pipes don't get clogged on their own. Fresh water, all by itself, won't get clogged every year if it's just running through plastic pipes. The impurities that come from my family are the things that clog those pipes. But both physically and spiritually, the Israelites and the priests were making the Tabernacle ... This is where the idea of Yom Kippur comes from. They were making the Tabernacle impure. Chris Katulka: To paint the picture, from year to year the Tabernacle, where God's holy presence dwelt, would literally take on the impurities of the Israelites, and for that reason, it needed to be cleansed. And this type of cleanses isn't the type that can be cleaned with some Clorox bleach and a scrub brush. This is a spiritual cleansing, friends. The Tabernacle in the book of Leviticus needed a spiritual cleansing. The impurity that built up on the Tabernacle needed to be spiritually cleansed, and that could only be provided by the blood of a sacrifice and also what we're going to talk about in a moment, a scapegoat. Chris Katulka: And this Jewish commentary is right, too. It wasn't just the sacrifice that happened. It was the ... Did you hear what it said in the beginning there ... the Right of Riddance. And let me explain what that Right of Riddance is. It's the practice of transferring Israel's sins onto a goat, a scapegoat ... That's where we get the name for a scapegoat ... and sending it away from the Israelite camp so that the people of Israel can literally watch their sins running away from them. Chris Katulka: Now, the Day of Atonement, Yom Kippur, is an act. I believe it's an act of God's divine grace. Remember the Tabernacle, and the Temple for that matter, were the central place of worship for the Israelites. And the reason it was the central place for worship for the Israelites was because that's where God's physical presence dwelt with His people. God's glory was in the Holy of Holies. God's holiness was in the Holy of Holies, sitting on top of the Ark of the Covenant. A holy God ... Think about this. A holy God was within impure people. And let me repeat that. When God was dwelling in the Tabernacle and the Temple, a holy God was dwelling with sinful, dirty, impure people. That same feeling you get when you have to unclog that drain, that's the image of a holy God being with an impure, dirty people. That's an act of God's grace. And those sinful, dirty, impure people were making God's holy dwelling place impure. And that's why the Day of Atonement, Yom Kippur, is all about purification, cleaning, cleansing. Chris Katulka: I want to dedicate some time to this idea of the Right of Riddance, this idea of a scapegoat. The high priest, according to Leviticus chapter 16, was to choose two goats. One goat for the sacrifice to the Lord, and another goat called an Azazel, which is either a proper name for Satan or the devil, or it could be a word that means to banish or to, literally, go away. Either way, the purpose of the Azazel goat was to become a scapegoat of the sins and the impurities of the Israelites. Those sins and impurities were, in the most literal fashion, imputed on the scapegoat when the high priest would take the goat and place his hands on his head. Chris Katulka: And listen to what Leviticus chapter 16, verses 21 and 22 say. It's says this, "Aaron is to lay his two hands on the head of the live goat and confess over it all of the iniquities of the Israelites and all of their transgressions in regard to all their sins. And thus, he is to put them on the head of the goat and send it away into the wilderness of the hand of a man standing ready. The goat is to bear on itself all the iniquities into an inaccessible land, so he is to send the goat away in the wilderness." That comes from Leviticus chapter 16. The scapegoat would take on the sins and impurities of Israel built up over the year and run off into the wilderness with them. Chris Katulka: When you read through this, there is a very similar scapegoat theme that appears in Isaiah 53. When Isaiah the prophet is talking about the suffering servant, a servant of the Lord who was chosen to suffer and would be mocked and beaten. And in his suffering he would bear the sins and transgressions of the people of Israel. Listen to Isaiah 53. Hear and listen to the similarities that appear between the scapegoat from Yom Kippur, from Leviticus 16, and the suffering servant. Listen to this. "He was despised and rejected by people, one who experienced pain and was acquainted with illness. People hid their faces from Him. He was despised, and we considered Him insignificant, but He lifted up our illnesses. He carried our pain. And even though we thought He was being punished, attacked by God, and afflicted for something He had done, He was wounded because of our rebellious deeds, crushed because of our sins. He endured punishment that made us well. Because of His wounds, we have been healed." Chris Katulka: The most natural place in the New Testament to connect the scapegoat and the sacrifices made on Yom Kippur to Christ's work on the cross in definitely found in the book of Hebrews. But I want you to see how even Isaiah the prophet, as he was predicting the suffering that Jesus would face on the cross, is connecting the suffering servant to the scapegoat in Leviticus 16. Listen, Isaiah writes, "The suffering servant would be despised and rejected." And I'm going to tell you something. I guarantee, the moment that scapegoat was chosen in Leviticus, there was no one in the camp who was sad that he would bear the sins of the people. I am confident that the people in the Israelite community, when that scapegoat was chosen, was glad to know that their sins were being imputed onto that goat. Chris Katulka: Folks, that goat was despised. And that goat, just like the suffering servant from Isaiah 53, carries the sins of the people with it. It was through the suffering of that goat in Leviticus chapter 16 that the Israelites were essentially healed. And Isaiah 53 says, "He was wounded because of our rebellious deeds, crushed because of our sins. Because of His wounds ..." Listen. "Because of His wounds, we have been healed." Chris Katulka: Folks, the scapegoat from Leviticus 16, I believe is pointing forward to Christ, who would be the one who all the sins of the world would be placed upon. He would bear our iniquity. He would bear our shame. He would bear our sin so that, in the end, He could say ... Do you remember? Jesus said this on the cross. "It is finished." No more sacrifices. No more annual Day of Atonement. Jesus, the Lamb of God, carried our sins away as far as the east is from the west. He paid for it once and for all. Steve Conover: Yom Kippur, or Day of Atonement, is the most serious day of the year for the Jewish people. Its central themes are repentance and atonement. The Friends of Israel's very own Bruce Scott authored the book The Feasts of Israel to help you discover more about the Day of Atonement and other Jewish holidays. Chris Katulka: Much of what Jesus said and did, it really requires us to know Jewish holidays that span back to Leviticus. And those passages can be really hard to understand. Remember, we're talking about millennia of separation between the book of Leviticus. And even today, reading The Feasts of Israel will help any reader see how Jesus used Jewish festival to bring to life His ministry in the Gospels. Steve Conover: Expand your knowledge of the Day of Atonement and the other feasts of Israel by ordering your copy of The Feasts of Israel by Bruce Scott. You can go to FOIradio.org. That's F-O-I radio dot O-R-G or call our listener line at 888-343-6940. Again, that's 888-343-6940. Chris Katulka: Welcome back, everyone. The Jewish honoring of Yom Kippur is upon us. You may know it as the Day of Atonement. In our previous segment, we talked a little bit about the scapegoat that bore the sins of the nation of Israel from Leviticus 16 and how Christ fulfills that aspect of being our scapegoat. But you know, there's a reason God instituted Yom Kippur in the Old Testament. The beginning of Leviticus chapter 16 opens with this. "The Lord spoke to Moses after the death of Aaron's two sons when they approached the presence of the Lord and died. And the Lord said to Moses, 'Tell your brother, Aaron, that he must not enter at any time into the Holy place, inside the veil canopy, in front of the atonement plate that is on the Ark so that he may not die for I will appear in a cloud over the atonement plate.'" That's the Ark of the Covenant. Chris Katulka: See, the whole issue surrounding Yom Kippur, like I said in the previous segment, is this. It's the issue of impurity, the pollution of God's sanctuary, the pollution of God's people, the pollution of the Tabernacle, the Temple, all of the utensils that were used, the altar, all of it. It needed cleansing. And one of the ways God's Tabernacle, His sanctuary, was polluted was actually through the story of Nadab and Abihu, the high priest Aaron's sons. Chris Katulka: Back in Leviticus chapter 10, Aaron's sons, who were actually ordained priests who served in the sanctuary, came to the Tabernacle approaching the Holy of Holies. And this is what the text says in Leviticus chapter 10, verse one. "Then Aaron's sons, Nadab and Abihu, each took his fire pan and put fire in it, set incense on it, and presented strange fire before the Lord, which He had not commanded them to do. So fire went out from the presence of the Lord and consumed them so that they died before the Lord." Folks, Nadab and Abihu polluted God's sanctuary by offering an authorized or unholy fire to the Lord. And God's wrath, you can see it. God's wrath was poured out on them. They were consumed by God's holiness. Chris Katulka: And listen, this is what Yom Kippur is all about. This whole idea of Yom Kippur is about a holy God interacting, remember this, with an unholy, impure people. And let me tell you. Because God is gracious and merciful and loving and kind, that doesn't mean that He compromises His holiness. Grace is seen in Leviticus in the way that God wants to be with His people. But at the same time, His people must come to Him according to His standards because God is holy. And the story of Nadab and Abihu show that even priests, the son of the high priest, must come to God according to His standards. Yom Kippur is all about God's way of approaching Him to find forgiveness, to find cleansing, to find God's righteousness from our impurities while never compromises His holiness. Chris Katulka: That's the grace we find in God when we approach the cross of Christ. God never compromised His holiness for our salvation. Instead, think about this, God didn't say, "Oh, my wrath doesn't need to be satisfied at all." Instead, God's wrath, that same wrath that met Nadab and Abihu and consumed them, the same wrath that we deserve was placed on Christ. God's wrath was satisfied. God's holiness was satisfied so that we might have eternal life. And here we see it once again. God provides a way. A specific way. Not the way we want to come, like Nadab and Abihu, doing whatever we want to you. You get to God that way. I go to God this way. Nope. That is not the picture we see from Yom Kippur. The grace of God is seen in that His holiness is never compromised and, yet, God provides a single way to Him. That's grace. That's grace, that we might have a personal relationship with Him. Mike Kellogg: In Israel, people are preparing for the feast of Rosh Hashanah, followed by the greatest holy day of all, Yom Kippur, the Day of Atonement. This is the only holy day people fear. Recently, some people came to me and said, "We want you to forget about your strange ways and come with us to pray." When I asked who had sent them they replied, "No one sent us. We have come on our own." "And, oh," I responded, "you did not come on your own, but God sent you so I could tell you that He has already forgiven my sins." "Oh, yes," they agreed, "He forgives us every year at this time with a great fast." "This is not what I mean," I countered. "I came to God only once. I put my faith in Him, and He forgave my sins. He can forgive your sins, also, once, forever." They were not interested in anything I said. Mike Kellogg: "If you will do as we ask," one told me, "you will have no more trouble with us." I told them, "I am not afraid of you. I fear only God." "How can you fear God when you do not believe in Him but in Jesus?" Another asked. I replied, "The Lord said, 'I've had enough of burnt offerings of rams.' Isaiah 1:11. I believe only in one offering, and that is the offering of the Lord, Himself, who gave Himself for us." "From what book did you take that," one asked. Quickly, I turned to Isaiah 53, and then I told them, "He is the one in whom I have trusted, and He has given me peace. I know that when I leave the world, I will dwell in the house of the Lord forever. You have come to tell me that I may experience trouble from you, but I am not afraid anymore." "Not even about your life when demanded?" "No, because I know whom I belong." Mike Kellogg: At this point, someone said, "If you're not afraid of us, then let us make a ceasefire and speak together as good friends." "That is what I have been waiting for," I replied. "I do not hate you. You're my dear friends, and you're welcome to visit me anytime." All of them said, "We cannot believe this." "May I read to you from the New Testament and tell you why I am so happy?" They agreed, and I read Romans 12:9-21. Mike Kellogg: After I finished, one man asked, "These things are nice to hear. But if Jesus loved His enemies, then why did the Germans, who are Christians, persecute the Jewish people so badly?" I replied, "I am sure that they were not true believers." "Now, many in Germany are sorry for what they did and are again calling on the Lord, but they are not really clean within. They only hope they are clean, just as you hope when you pray at Yom Kippur. On the Day of Atonement, you will not be sure if the Lord has forgiven your sins." "But I know He has forgiven mine. My friends, why do you continue to live in fear? The Lord is your atonement. He will receive into His family and forgive your sins. You came hatefully to warn me, but the love of the Lord has been with us. We should thank the Lord that He is with us." Mike Kellogg: These people left my home feeling differently than when they came. They left with love in their hearts and smiles on their faces. Praise the Lord. Steve Conover: Thanks so much for joining us for the program today. Chris, as we close, any thoughts? Chris Katulka: Yeah. As we're wrapping this show up, I really want you and our listeners to understand that God never compromised His holiness. The grace of God doesn't mean that God compromises His holiness. In fact, when we talk about God's grace, we're talking about the fact that God would actually provide a very specific way to have a relationship with Him. That's God's grace. He never compromised who He is, His nature, or His holiness. He provided a specific way through Jesus Christ, our sacrificial lamb, our scapegoat, to have a relation with Him. Steve Conover: Thank you, Chris. The Friends of Israel Gospel Ministry has been sharing the love of the Messiah and supporting Israel and the Jewish people since 1938. To financially support The Friends of Israel Today Radio Ministry, visit FOIradio.org. That's F-O-I radio dot O-R-G. You can call our listener line at 888-343-6940. Again, that's 888-343-6940. You can write to us at FOI Radio, PO Box 914, Bellmawr, NJ, 08099. I'll give that you once more. It's FOI Radio, PO Box 914, Bellmawr, NJ, 08099. And please, let us know where you're listening when you call or write. Steve Conover: Our host and teacher is Chris Katulka. Today's program was produced by Tom Gallione, co-written by Sarah Fern. Mike Kellogg wrote Apples of Gold. Our theme music was composed and performed by Jeremy Strong. I'm Steve Conover, Executive Producer. The Friends of Israel Today is a production of the Friends of Israel Gospel Ministry. We are worldwide Christian ministry communicating biblical truth about Israel and the Messiah while fostering solidarity with the Jewish people. Yom Kippur or Day of Atonement is the most serious day of the year for the Jewish people. It’s central themes are repentance and atonement. 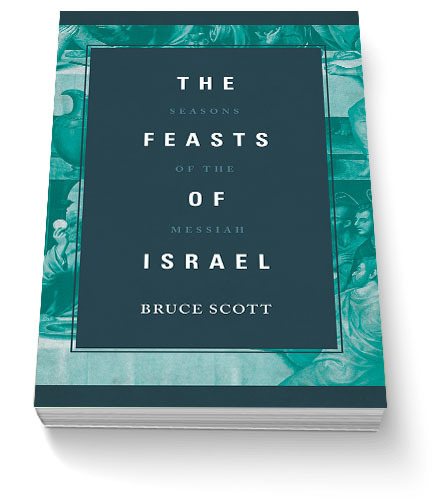 The Friends of Israel’s very own Bruce Scott, authored the book The Feasts of Israel to help you discover more about The Day of Atonement and other Jewish holidays. So much of what Jesus said and did requires us to know Jewish holidays that span back to Leviticus and those passages can be hard to understand. Reading The Feasts of Israel will help any reader see how Jesus used the Jewish festivals to bring to life His ministry in the gospels. We learned in our first segment that the issue impurity is why God instituted Yom Kippur. In our second segment we go to Leviticus and we read about Aaron’s sons Nadab and Abihu, the High Priests. They made unauthorized offerings to the Lord and were killed. Chris will explain how this was not an unmerited act by God. God cannot compromise His holiness. During Rosh Hashanah and before Yom Kippur, a group of people came to Zvi to try to get him to see the way of Judaism is the correct way to God, not the way he says you go to God, through Jesus the Messiah. They asked him to come to synagogue with him to observe Yom Kippur. Because of their pure intent and their heart attitude, Zvi was able to have an open and honest discussion about why he believed what he did and they were open to hearing the Truth that lies in Scripture. I’m not Jewish by birth- but I am in my heart! Thank You: Appreciate explanation and references for this Feast.